The past couple of years, I've been hearing a lot about dog car safety (or lack of safety). Small dogs like me are as fragile as human infants. Mom wants me to be as safe as a human infant when we travel. Let me tell you about why I am so happy that I met the people from PupSaver while I was at Global Pet Expo. Most of the available dog car safety systems are designed mainly to restrain the dog. I want something that will protect me from serious injury. I also want to be comfortable and be able to turn around during long road trips to pet conferences. Like many small breed dogs, I have a very fragile throat. I do not want a crash to put any pressure on my delicate windpipe. As a medical alert dog, I prefer to ride in the front seat so that I can reach Mom to do my job. Working dogs usually spend even more time riding in the car than other dogs. Even small dogs who are not service dogs tend to go on more car trips than large non-working dogs. Our humans need something that is as fast & easy to use as a human child safety seat. Most of the available dog safety systems require a special harness to pass the crash testing. Mom has been looking for a safety device that would work with my normal harness. She says it wouldn't be practical if she had to change my harness every time I got in & out of the car during our errands. Now that I've explained what I want and the reasons why I need something really special, I am excited to bark that I have finally found a crash tested product that meets all of my needs - the PupSaver! 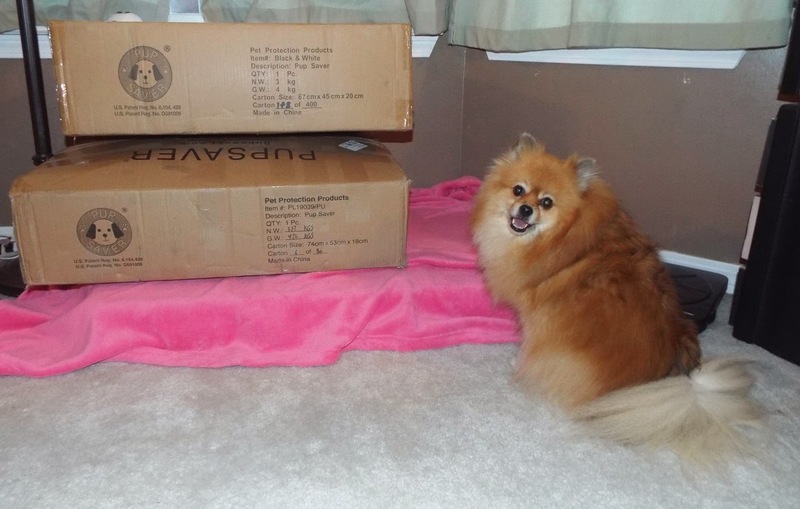 The PupSaver is a special padded seat designed specifically to meet the safety needs of small dogs (under 30 pounds). The PupSaver is designed to work in both the front and rear seats. This way your human can put you in the spot they prefer. 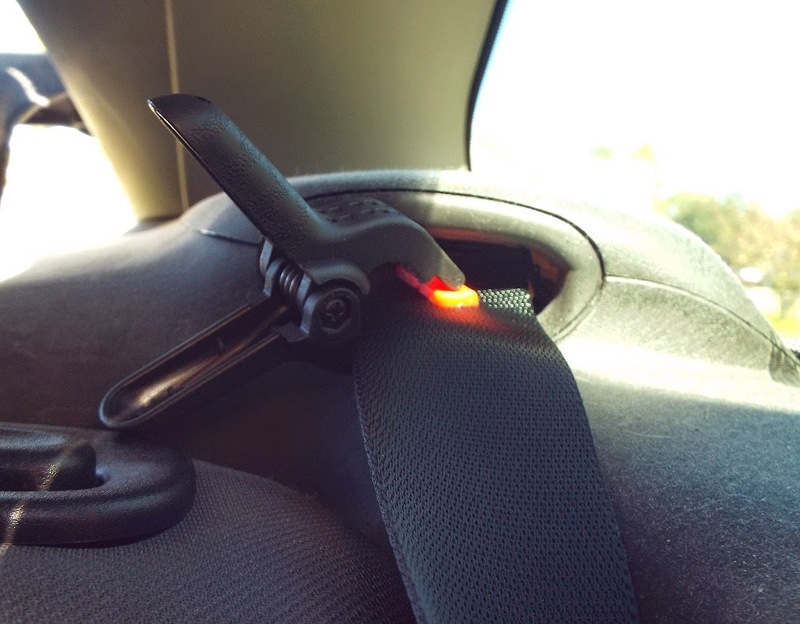 The PupSaver uses your car's seat belt to hold it in place. It comes with a special clip to prevent the seat belt from retracting during normal driving conditions. To install the PupSaver, the first thing your human needs to do is to pull the seat belt all the way out, and attach the clip. Then, your human closes the seat belt latch like they usually do. Now for the fun part! Attach the 3 buckles on the PupSaver bottom around the lap part of the seat belt. Next, your human hooks the front 2 loops around the shoulder part of the seat belt. Then your human lets the seat belt slide through the clip until it is tight enough to hold the PupSaver in place, but loose enough not to fold the PupSaver closed. 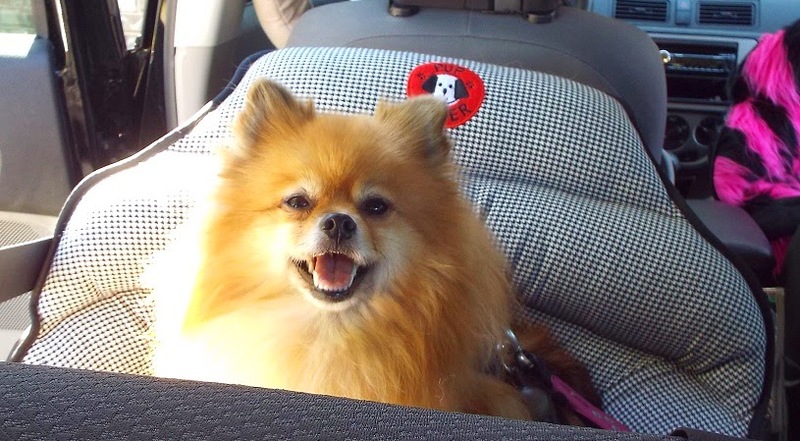 The PupSaver works on both sides of the car, but Mom thinks it fits passenger side seat-belts the best. Remember that I woofed about not letting the seat belt get too tight or it could close the PupSaver? The above photo shows what the PupSaver looks like when that happens. This is how it protects us during a crash. The force of sudden seat belt retraction is stronger than regular seat belt tension. The seat belt retracts during crashes and folds the PupSaver into a padded nest around you. The PupSaver's padding is designed to protect you from air bags and other impact possibilities. Is any other pup imagining a flying pizza box? "The PupSaver small dog car safety seat has undergone a series of tests and has successfully contained a 25-pound occupant in a 30 mph frontal crash test similar to that of FMVSS 213 for child safety seat testing"
In stock black & white houndstooth with ballistic nylon backing PupSaver. You need to be in the PupSaver for it to be able to protect you. There is a tether in the center of the PupSaver that attaches to your normal harness. Your human should keep the tether short enough to prevent you from walking out of the PupSaver. It is very comfortable. I've already been on a 6 hour road trip in my PupSaver. 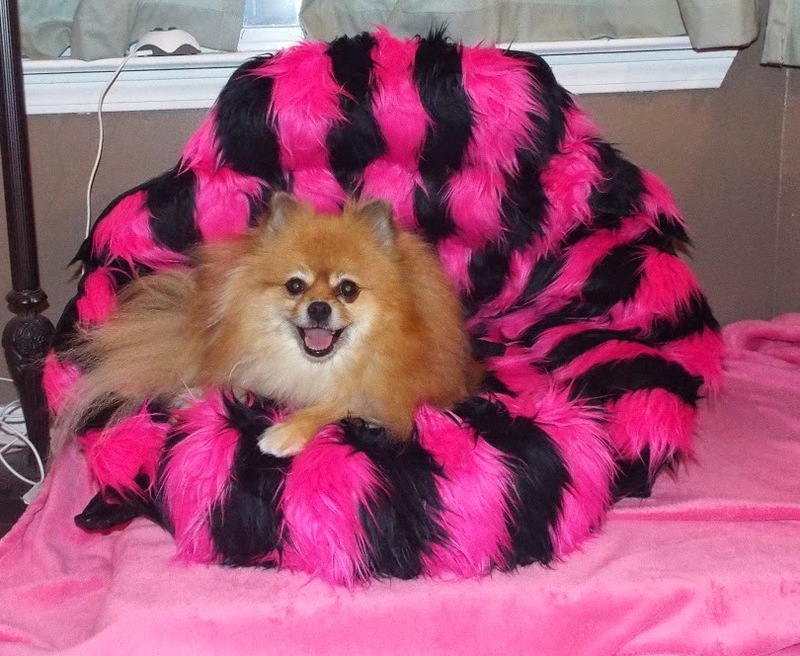 Special order pink & black faux tiger fur with pleather backing PupSaver. I am really happy that the PupSaver is also fashionable. Once I saw it, you know I just had to get my paws on this furry pink & black zebra print PupSaver. 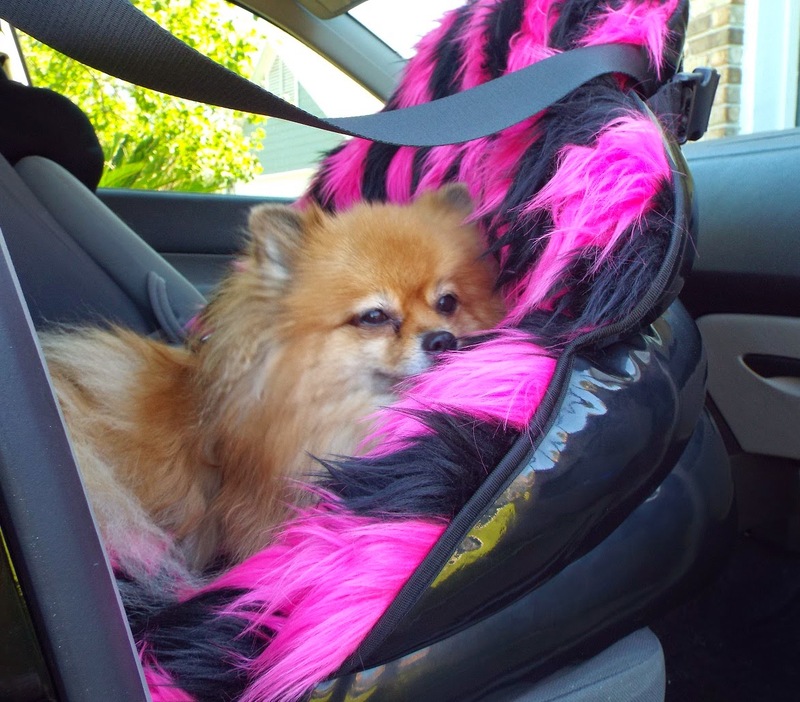 Now I am riding safely, and in pink Pommie princess style! It's sooooo pawfect for me! It's the only one they had, so they let me have the one they used in the expo shows. The PupSaver is available in several ready to ship fabrics, or you can request to special order a custom one like my furry pink & black zebra PupSaver. Note: If you want a custom one, you will have to wait a while because they aren't made until they are ordered. Oh Pepper, those are FABulous!!!! OMD, I wish they made them for big doggies like MOI, i really loves the pink zebra!!! It is just so YOU Pepper!!! I am so glads you are ridin' safely with your Moms!! That is definitely fashionable and probably good for small dogs. How COOL! do you think they have that for large dogs :-) Woofs to you Pep. Scooter thinks you're onto something here with the PupSaver Pepper! We have a Sleepypod which is great, but Scooter is barking about having more options to try out for different types of car rides! That is so cool, Pepper...and SO your color!!! I am glad you found something to protect you while in the car. We all need to be safe. Great review.